Let’s just be honest: style, for men, is a hard thing to grasp. It’s especially hard when buying new clothes. We always forget our sizes, we don’t know how things are supposed to fit, and we can never figure out what matches or looks good. Sometimes what we buy ends up sitting in the closet because we don’t like the way it fits or looks when we wear it. In short, shopping for clothes can feel like a confusing or frustrating process. But it doesn’t have to be. What if I told you there was a way to simplify style? If you can focus on the easy-to-remember tips in this article, you’ll be able to walk into any store with a clear idea of what to buy, and you’ll walk out and into the world with confidence in how you look. 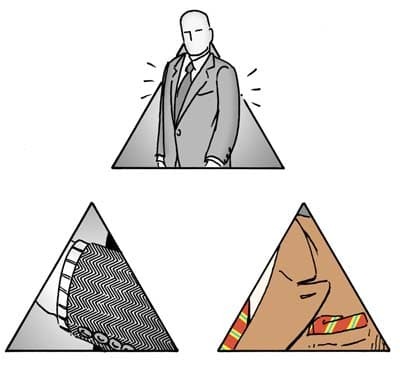 My favorite tool for selecting clothes that look good on you is the Style Pyramid. 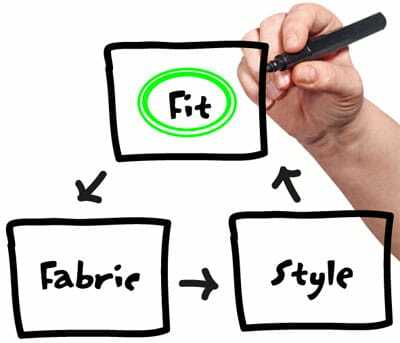 It’s a simple three-step rubric: Fit, Fabric, and Style. A piece of clothing that doesn’t meet all three criteria is a piece of clothing you’re better off not wearing. Fit is at the top of the pyramid for a reason. The way your clothes sit on your body affect the way they look to others more than anything else about them. 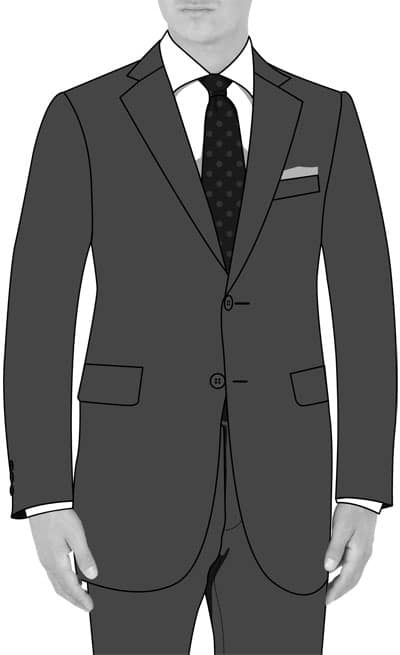 Most men wear a suit that is two sizes too large. Fit matters – a lot. Now, that doesn’t mean that you can look sharp-dressed in totally inappropriate clothes just because they fit well. A custom-tailored banana suit is still a banana suit. But it does mean that the best suit in the world can look awful on someone it’s not fitted for. Think of it as the ultimate fashion triage: does the item in question fit your body? If not, skip it. It’s not worth wearing, no matter what its other merits might be. The most general guideline for a good fit is that it should sit close to your skin without pinching or constricting. You shouldn’t feel the cloth tugging when you move around, but you also shouldn’t have any loose billowing or sagging. In general, you should always be able to slip one or two fingers between the clothing and your body. But, every piece of clothing is a little different, so we’ll take a look at how to get the perfect fit for each item separately. Notice there is no billowing around the waist – beware the muffin top! 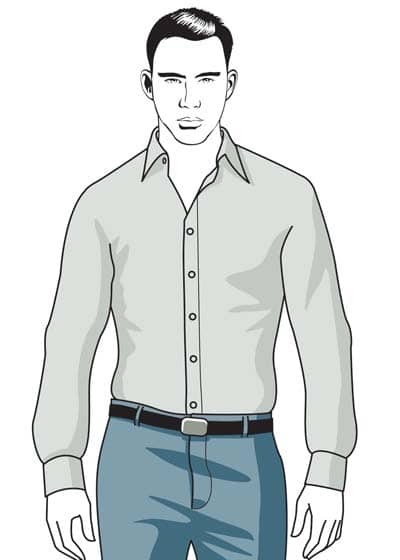 We’ll assume a collared shirt here so that we cover all the bases, but these guidelines work fine for T-shirts and other non-collared shirts as well. The only real difference is that a shirt you’ll be wearing untucked can be a little looser around the stomach and waist without it being noticeable. The shirt collar should rest on your neck but not pinch it. In the case of a dress shirt, this should be with the collar button fastened, as if you were going to wear a necktie. If you can’t do that without feeling constricted, or if there’s a gap between the cloth and your neck, the fit is off. The shoulder seams should end right where your shoulders do — the point where the vertical plane of your bicep intercepts the horizontal plane of your shoulder. If they don’t reach all the way, or if you’ve got part of the seam hanging down your bicep, it’s a no-go. This is a tough one for a tailor to adjust, so if the shoulder fit isn’t good to begin with, it’s usually not worth buying. The cuffs should be long enough to cover the large bone in your wrist (the one directly above your pinky finger). If it’s shorter than that it won’t show properly beyond a suit or sports jacket sleeve. A straight sleeve or a slightly tapered one are both fine; the taper gives a better fit for most men. The hem should fall at least three or four inches past your waist so that it can tuck in completely. If it has “tails” in the front and back, rather than an even hem, make sure the points at the side where the tails come together can tuck in, as well as the longer tails in front and back. You need the whole shirt to tuck, not just the longest parts. The waist is where a lot of guys are wearing too much cloth. If your torso tapers, your shirt needs to as well. “Slim fits” can help with that, and it’s a relatively minor adjustment for a tailor to take the shirt in as long as there isn’t too much excess fabric. Get as close a fit as you can manage off the rack and then take it to a tailor if you need more. Very tall or very short men also need to keep an eye on proportion. It’s easy for a breast pocket to wind up too far up or down your chest, or for a collar to be too short for your neck, especially when you’re having things adjusted. 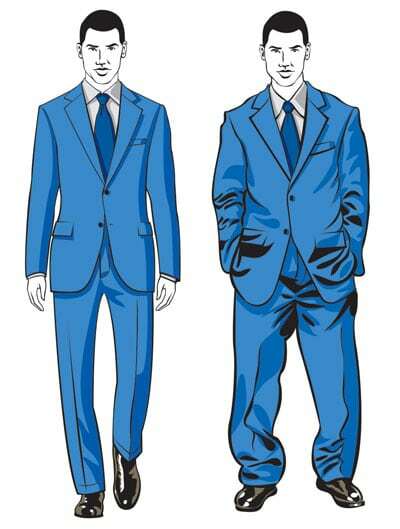 Keep an eye on the details and make sure none of them are “floating” too far from where other men are wearing theirs. A jacket gets a little more space off the body than a shirt, but not much. You’re still trying to avoid gaping open spaces, billowing or hanging cloth, and anything tight enough to pinch or pull. Shoulders, like with shirts, have to be well-fitted to begin with. They can’t be adjusted, generally speaking. Like the shirt, the seam should end right where your shoulder does, not before the turn or hanging over it. The chest is usually the only numerical measurement for off-the-rack jackets. If it’s taken right, the lapels of your jacket should rest comfortably on your shirt front when you stand, with just enough slack that you can slide a hand into the inner pocket. If the lapels are hanging far enough forward that there’s visible space between the shirt and the jacket in your natural resting pose, it’s too loose. The waist affects how the buttons close. They should fasten without any tugging or pressure on the button (it not only looks better, but it’ll also save you buttons popping off). The buttoned sides of the jacket should rest on the shirt beneath them, with the fabrics touching. The sleeves should fall just a bit shorter than your shirt sleeves. “A half-inch of linen” is the traditional phrase, but in practice it can vary a bit, so long as the shirt is visibly longer than the jacket you are just fine. Length should be at least enough to fall past the curve of your buttocks, rather than resting above it. Your big warning signs with a jacket are flapping around the lower part, gaps between the jacket and your chest, and of course, any tugging or tightening when you move. Tightness in the arms or sides can also show up as wrinkles where the fabric is pinching. 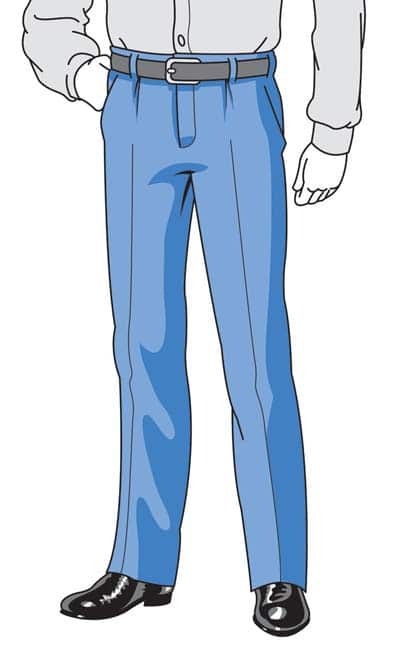 Notice the crotch doesn’t extend down to the middle of the thighs – and the material near the cuff isn’t overly bunched.